In the year 1903 a local Catholic, Major General Arthur Kennedy Rideout, arranged for a priest to come on horseback from the Twickenham area to celebrate Mass for the handful of Roman Catholics at that time in Englefield Green. In the grounds of his house, Sandylands, he built a small corrugated iron chapel which accommodated about 25 people. In 1907 a wooden church was built in Harvest Road and dedicated to St.Cuthbert. The original church from Sandylands was added on to it and formed a vestry. 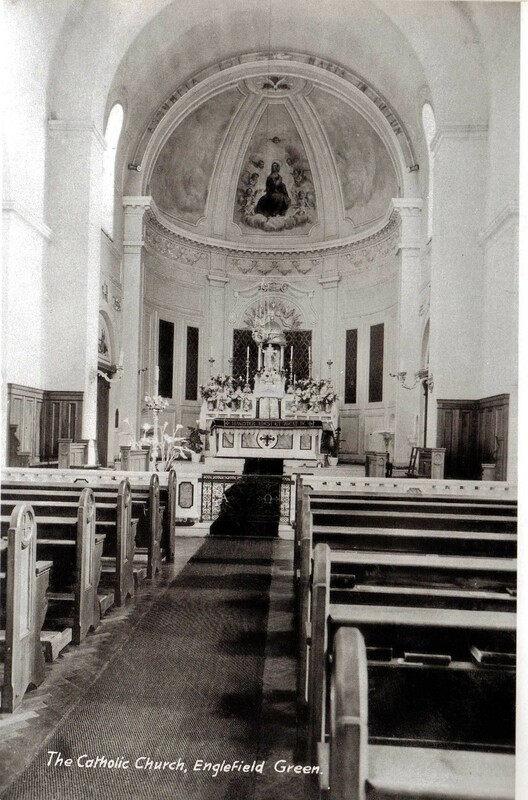 It was in Father Tyndall’s time, 1929 to 1932, that parishioners Gerard and Miriam Jurgens offered to buy a piece of land and build a church at their own expense to replace the existing wooden one. 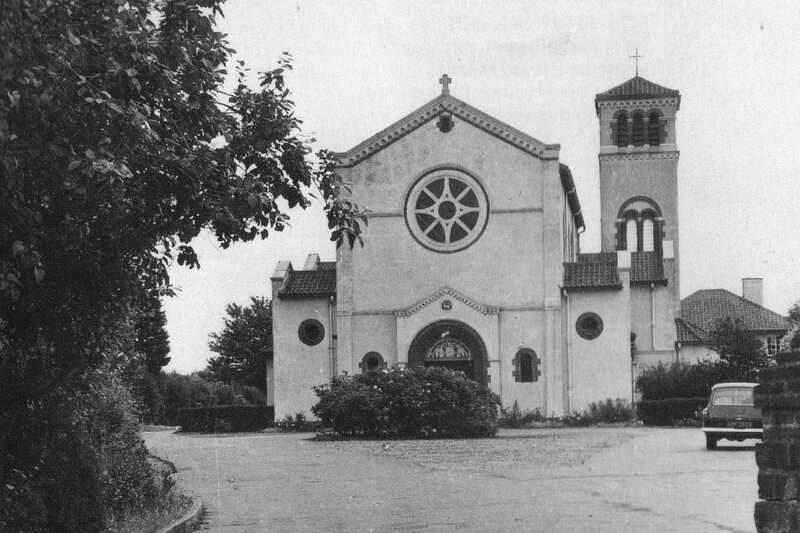 They bought the site in Harvest Road where the present church was built and on September 20th 1931 was blessed and opened. The church is in Italian Romanesque style. At the request of the Jurgens family the dedication to St.Cuthbert was altered and the new church consecrated in honour of the Assumption of Our Lady. Accordingly a painting of this subject, given to the church, hangs above the high altar and is the work of Antonio Palomino who was artist to the kings of Spain in the seventeenth century A fine organ was donated to the church by David Greig, the founder of a then well known chain of grocery stores. The old wooden St.Cuthbert’s church served the parish as a church hall after the new church was built. The name Saint Cuthbert has been perpetuated in the naming of the Roman Catholic Primary School in Corby Drive which began in that hall when a number of children were evacuated to this district from the East End of London during the Second World War. The Diamond Jubilee of the church was celebrated in September 1991. Our thanks go to Graham Dennis & Richard Williams for allowing us to reproduce this section of their book, “The Englefield Green Picture Book”.